What should I do?, How should I deal with this?, How should I behave?, How should I act? we ask ourselves daily. But, this is only the first part of the sentence, while the full sentence is What should I do … to achieve such and such?, for example to complete an assigned task, to do well before my boss or a client, to be pleased with myself, to carry out my plans, to make money in the stock market, to pass an exam, to complete an application, etc. These and similar questions that people ask, consciously or not, openly or not, are decisions.What skills must we master, especially when there is a need to make not only elementary decisions, but also decisions that affect the existence, health, and even lives of people? First, Laszlo Zsolnai writes that we should acquire the skill of gaining knowledge. Only then will we stand a chance of reacting to things that are improbable today, but could become a fact tomorrow. Also essential is the skill of designing, i.e., preparing actions conceptually in order to make decisions before irreversible changes occur. 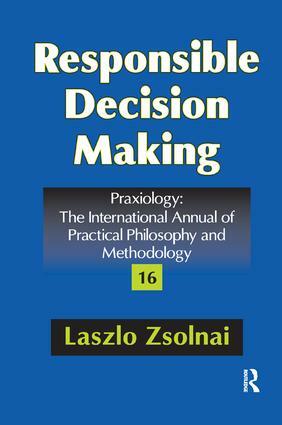 Finally, it is essential to master the skill of multidimensional judgment within the space defined by effectiveness, efficiency, and ethics.This is Zsolnai's attempt to build a model of making ethical decisions both effectively and efficiently. Therefore, the model is much broader than purely an analytical framework would be. It must tell us how to act rather than limit us to reflection on actions already performed; it must combine decision and praxiological analysis of human conduct. The proposed model enlarges the scope of the debate and suggests new avenues of both rational and responsible decision making. This is an original statement of the crossover of policy and morality.